A concussion is an injury to your brain that causes problems with how the brain works. It can affect brain tasks like memory, balance, concentration, judgment, and coordination. Most will have a full recovery, but the brain will need time to heal with the proper rest and monitoring. A concussion can cause symptoms that may last for days, weeks, or even longer. They may be immediately present or appear a few hours or days after the injury. The symptoms that develop will depend on the severity of the injury. More common symptoms are listed below. A doctor should be consulted if serious symptoms like confusion and vomiting occur or if symptoms get worse. You will be asked about your symptoms and how the injury occurred. Others who witnessed the accident may also be asked to describe what happened and how you reacted. A physical exam will be done. It will often include brief tests for strength, sensation, balance, reflexes, and memory. 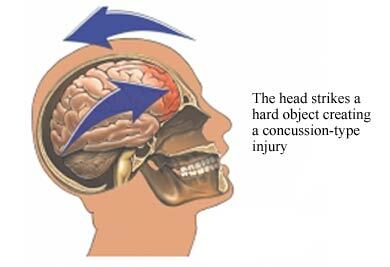 The doctor will often be able to diagnose a concussion based on the exam and history. A CT scan may be done if there are severe symptoms or certain risk factors but are not always needed. The brain can usually heal on its own with some rest and avoiding activities that may be harmful while it heals. Normal activities can be resumed when tolerated and if advised by the doctor. Strenuous physical activity and sports participation may be resumed depending on the severity of your concussion and individual symptoms. Symptoms will gradually fade during recovery. There may be cognitive problems after a concussion that can make mentally-demanding tasks more difficult. Early in recovery, activities that need concentration like work or schoolwork may be difficult. Also, consider reducing video games, watching television, computer activities, or texting. Increase mental and physical activities gradually as recommended by your doctor based on how you feel. Symptoms, balance, cognition, and tolerance to current activity levels may be tested throughout recovery. Use of alcohol and illegal drugs. Activities that might jolt or jar the head from recreational activities and sports to rollercoasters. Second head injury can be especially dangerous in children and adolescents (second impact syndrome). Even a mild second head injury in children and adolescents can lead to serious damage to the brain. This can lead to unconsciousness and even death. Always use seatbelts, shoulder harnesses, and child safety seats when traveling in vehicles. Follow recommendation for child car safety options. Learn about the air bags in your car. Young children should not be placed in front of airbags. Check your cars specifications. Make sure your child's play surface is soft and free of rocks, holes, and debris. Use handrails when walking up and down stairs—teach your child to do so. Install safety gates by stairs and safety guards by windows. Use grab bars in the bathroom. Place non-slip mats in the bathroom. Keep walkways clear to avoid tripping. Make sure rooms and hallways are well lit. Concussion and mild traumatic brain injury. EBSCO DynaMed Plus website. Available at: http://www.dynamed.com/topics/dmp~AN~T116529/Concussion-and-mild-traumatic-brain-injury . Updated October 9, 2017. Accessed February 7, 2018. Kirkwood MW, Yeates KO, Wilson PE. Pediatric sport-related concussion: a review of the clinical management of an oft-neglected population. Pediatrics. 2006;117(4):1359-1371. Pearce JM. Observations on concussion: a review. Eur Neurol. 2008;59(3-4):113-119. Sports-related concussion information for athletes. Wesleyan University Athletic Injury Care website. Available at: http://athletics.wesleyan.edu/Performance%5F-%5FCare/concussions. Updated January 2007. Accessed February 7, 2018. Traumatic brain injury and concussion. Centers for Disease Control and Prevention website. Available at: http://www.cdc.gov/TraumaticBrainInjury/index.html. Updated February 9, 2016. Accessed March 16, 2017. What can I do to help feel better after a mild traumatic brain injury? Centers for Disease Control and Prevention website. Available at: https://www.cdc.gov/traumaticbraininjury/recovery.html. Updated January 22, 2016. Accessed February 7, 2018. 10/5/2010 DynaMed Plus Systematic Literature Surveillance http://www.dynamed.com/topics/dmp~AN~T116529/Concussion-and-mild-traumatic-brain-injury : Parikh SN, Wilson L. Hazardous use of car seats outside the car in the United States, 2003-2007. Pediatrics. 2010;126(2):352-357. 12/10/2010 DynaMed Plus Systematic Literature Surveillance http://www.dynamed.com/topics/dmp~AN~T116529/Concussion-and-mild-traumatic-brain-injury : Bakhos LL, Lockhart GR, Myers R, Linakis JG. Emergency department visits for concussion in young child athletes. Pediatrics. 2010;126(3):e550-556. 2/21/2017 DynaMed Plus Systematic Surveillance http://www.dynamed.com/topics/dmp~AN~T116529/Concussion-and-mild-traumatic-brain-injury : Grool AM, Aglipay M, et al. Association between early participation in physical activity following acute concussion and persistent postconcussive symptoms in children and adolescents. JAMA. 2016 Dec 20;316(23)2504-2514.